The liturgical celebrations inaugurating the Petrine ministry of His Holiness Pope Benedict XVI were themselves evidence of the value and substance of the Ordo Rituum pro Ministerii Petrini Initio Romae Episcopi. Pope Benedict XVI, who presided at those celebrations, and the whole people of God, who joined him, thanked to God for giving his Church a new successor to Saint Peter, a new Bishop of Rome called to preside in charity. In celebrating God's work, the Church recalled (anamnesis) the ministry which Christ entrusted to Peter by listening once again to the words which the Lord once said to Simon: “Tu es Petrus, et super hanc petram aedificabo Ecclesiam meam”, and again: “Pasce agnos meos”. These words instituting the Petrine ministry, repeated by the Church, renewed the Lord's mandatum to Peter and so were echoed in the proclamation of the Word of God and in the euchological texts, hymns and acclamations. The words Jesus which spoke to Peter at Caesarea Philippi and on the shore of the Sea of Galilee, he repeated to Benedict XVI at the beginning of his ministry, through the liturgy of the Church. Celebrating God's fidelity to his Church, these liturgies made present the hodie of the Petrine ministry. At the same time the Church reminds herself that, although the new Pope, like Saint Peter, receives from the Lord and from him alone the mandatum to feed the flock, he receives it only in Ecclesia and propter Ecclesiam. That is why, as the Fathers of the Church emphasized, in the Gospel accounts it is always in the presence of the apostles, and never without them, that Jesus makes Peter the rock of the Church and shepherd of his flock. The beginning of the ministry of the Bishop of Rome takes place in the ekklesia, in the liturgical assembly, the pre-eminent manifestation of the Church, inasmuch as the Petrine ministry is a gift of God and is always bestowed in medio Ecclesiae. Hence the great value of the Ordo for the hodie of the Church’s life. Although every liturgical celebration is pre-eminently a manifestation of the Church (cf. Sacrosanctum Concilium, 41), this is particularly true of the celebrations of the Ordo Rituum pro Ministerii Petrini Initio Romae Episcopi. In these celebrations the Church, per ritus et preces, explicitly wishes to manifest herself. The Ordo Dedicationis Ecclesiae et Altaris, a fruit of the liturgical reform of the Second Vatican Council, is itself – in its texts and signs and ritual – a mystagogy of the Church. The Ordo of 2005 completes that vision of the Church with the Petrine ministry. The Ordo Rituum for the beginning of the Petrine ministry is probably, with the Ordo Dedicationis Ecclesiae, the most complete and effective icon which the liturgy can offer of the Church after the Second Vatican Council. We owe the Ordo Rituum pro Ministerii Petrini Initio Romae Episcopi to the liturgical sense and the initiative of the Master and the Consultors of the Office for the Liturgical Celebrations of the Supreme Pontiff. The tradition of a specific ritual for the inauguration of the Petrine ministry of the Bishop of Rome had been gradually lost in the papal celebrations of more recent times. Although the process of simplifying papal rites begun by Vatican II had abolished certain ritual elements connected with the papal court and others which no longer corresponded to the new biblical-liturgical awareness - for example, the solemn coronation of the new Pontiff with the tiara, the rite “sic transit gloria mundi”, or the presentation of the keys of the Lateran Basilica - it had failed to identify and incorporate in the rites for the beginning of the pontificate signs and ritual actions capable of expressing the essence of the Petrine ministry “according to the norm of the holy Fathers”. This meant that the “solemn inauguration of the ministry of the Pastor of the universal Church” celebrated for Popes John Paul I and John Paul II consisted in a solemn Mass in Saint Peter's Square, in which the new Pontiff was invested with the same pallium worn by metropolitan archbishops and received the obedience of the College of Cardinals. This situation was confirmed by the Constitution Universi Dominici Gregis issued in 1996. That document, following indications given by Pope Paul VI in the Constitution Romano Pontifici Eligendo, called for two rituals to be prepared, one for the funeral of the Pope and the other for the rites of the Conclave, but made no mention of a ritual for the beginning of the pontificate: “After the solemn ceremony of the inauguration of the pontificate, and within an appropriate time, the Pope will take possession of the Patriarchal Archbasilica of the Lateran, according to the prescribed ritual” (No. 92). The Office for Liturgical Celebrations first prepared only those Ordines called for by the Constitution: the Ordo Exsequiarum Romani Pontificis and the Ordo Rituum Conclavis. During the preparation of these Ordines, however, it became clear that a third ritual would be necessary for the rites for the inauguration of the pontificate. 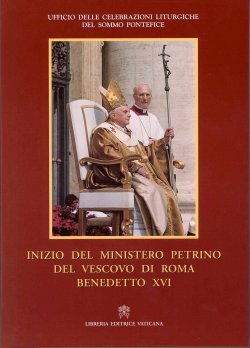 As a result, after the two aforementioned Ordines were published in 2000, and the work involved in the celebration the Great Jubilee had ended, the Office began at the end of 2001 to plan and draft the new Ordo for the beginning of the Petrine ministry. After various drafts and revisions, by early March 2005 the text was almost ready. It needed only to be completed in certain parts in Latin and in Italian, with a final collegial reading by the Consultors. Unfortunately there was no time for this re-reading because of the swift decline in Pope John Paul II's condition, followed by his death. The Ordo was therefore submitted for approval to Pope Benedict XVI and was printed by the Vatican Press. A few minor corrections and textual improvements were made in the booklets prepared by the Office to enable the faithful to participate more fully in the celebrations for the beginning of the Petrine ministry: Inizio del Ministero Petrino del Vescovo di Roma Benedetto XVI, Piazza San Pietro, 24 aprile 2005 (containing in addition the texts for the Visita alla Basilica di San Paolo fuori le mura, Monday 25 April); Celebrazione eucaristica e insediamento sulla Cathedra Romana del Vescovo di Roma Benedetto XVI, Basilica di San Giovanni in Laterano, 7 maggio 2005 (also containing the texts for the Visita alla Basilica di Santa Maria Maggiore, sabato 7 maggio 2005). Finally, the preparation of the present volume with its reflections on the significance of the texts and the rites of the Ordo, offered an opportunity to consider possible improvements to the text of the Ordo. A series of specific suggestions, together with the corrections already inserted in the booklets mentioned above, emerged from this period of reflection. Clearly the Ordo Rituum pro Ministerii Petrini Initio Romae Episcopi could not be published until it had received the approval of the new Pope. Approved on 20 April, it was printed a few days later by the Vatican Press. There was no time to supply the volume of the new Ordo with a commentary, as had been done for the Ordo for the Pope's funeral and the Ordo for the Conclave in the volume Sede Apostolica Vacante, published in March 2005. The present publication, coming a year after the beginning of the pontificate of Benedict XVI, fills that void, illustrating the theological and liturgical substance of the new Ordo. The volume has four parts: historical, theological, ritual and celebratory. It starts with the presentation and analysis of the historical data regarding the beginning of a pontificate from early Christian times to our own. The genesis of the rite of the installation of the Bishop of Rome is then presented through successive cultural periods. An ample analysis of the documents offers the reader not only the elements needed to appreciate the continuity of the Ordo Rituum pro Ministerii Petrini Initio Roma Episcopi with the centuries-old tradition which preceded it, but also the facts needed to appreciate its distinctiveness with regard to that tradition. This historical analysis is followed by a theological analysis. The first study examines the development of the theological content found in the ritual evolution from the Rite for the Coronation of a Pope to the Rites for the Inauguration of the Petrine Ministry of the Bishop of Rome. Emphasis is given to the ritual language of the new Ordo. The move from “object” to “person”, from the “sacred” to the “holy”, from papal power to Petrine service, reveals how closely the new Ordo is linked to the rich teaching found in the conciliar Constitution Sacrosanctum Concilium about what is variable and invariable in the lex orandi. The studies in this second part of the book, each from its own angle, focus on the various biblical, patristic, oriental, Christological, pneumatological and ecclesiological components. The euchology is presented in its elements of tradition and innovation. The final study in the theological section is devoted to an analysis of the work of drafting the various projects of the Ordo, a task which gradually led those involved not only to the formulation of the approved text but also, and above all, to the biblical, patristic and theological concepts which underlie it. The theological presentation is followed by the presentation of the ritual elements. Particular aspects of the new rite are successively highlighted, first its “geography”, in other words, the singular nature of the locations and the symbolic importance of the itinerarium and the different stationes which bring the new Pope to the four Roman Basilicas. This shows how the places of the celebrations and their movements clarify the meaning of the Petrine ministry. The ancient ecclesiological metaphors and the “Petrine” symbols are complemented by the principal signs found in the liturgies for the beginning of the Petrine ministry: the papal pallium, the anulus piscatoris and the cathedra Lateranensis. Each of these signs is studied in terms of its form, material and technique of production. The fourth, final section of the book consists of a description and assessment of the principal aspects of the celebrations. First, their iconic-visual composition, with emphasis on the meaning and implications of the choice and organisation of the liturgical space for each liturgy. A presentation of their audio-musical dimension then follows, including a detailed description of the programme of music for the various ritual moments of each celebration. The last studies, on the filming and the live television broadcasts of the events, as well as their reviews in the press, bring out the complexity of such broadcasts and the important role played by the media. The volume concludes with an index of names and an analytical index meant to facilitate consultation. May the lex orandi which finds expression in the Ordo Rituum pro Ministerii Petrini Initio Romae Episcopi be a place of encounter and a starting point for renewed dialogue between Sister Churches, in their quest of visible communion and in the acknowledgement of this ministry which the Lord has placed at the service of that communion. The publication of the Ordo Rituum pro Ministerii Petrini Initio Romae Episcopi and the present volume of commentary would not have been possible without the contribution of our Consultors, who generously offered the Office for the Liturgical Celebrations of the Supreme Pontiff their competence in the Liturgy and their spirit of love and service for the Successor of the Apostle Peter. During the course of the volume’s preparation, Father IGNAZIO MARIA CALABUIG ADÁN, OSM and Father JESÚS CASTELLANO CERVERA, OCD, friends and travelling companions of many years, who shared a passionate interest in the liturgical reform of the Second Vatican Council, were called to join the company of the saints. Father Ignazio died on 6 February 2005, while reviewing the Latin and Italian texts of the Ordo. Father Jesús died on 15 June 2006, a few days after he had handed in his contribution for this volume. Their testimony of faith and of love for the liturgy, the Church and the Successor of Peter, confirm our trust that the Holy Spirit who prompted the liturgical renewal and inspired the Council Fathers, continues to accompany the implementation of the liturgical reform and to make present the hodie of the Petrine ministry in holy Church. May the memory of Father Ignazio and Father Jesús help us to make the liturgy an experience of life, so that we can repeat in communion with them the words of an ancient Father of the Eastern Church: “I know that I shall not die, for I am immersed in life, and I feel it in all its fullness pulsing within me”.